Back in the early naughties he was pioneering the concept of one person journalist shoot editors. A complete news reporting package with small personal issue kits that could be stashed in a backpack. I loved the ethos. Small-form cameras, allowed you to get in amongst the action, capturing the real story without the paraphernalia of Hollywood changing the dynamic of the situation. People behaved normally and you could tell a story exactly as you saw fit without it being reinterpreted by the camera operator you were working with at the time. I got some great stories and took it as far as I could, but making them broadcast quality was always a challenge. I got some things aired I’d shot on a Canon 60d but back then everything coming from a DSLR was fatally flawed in some critical way. The Panasonic GH5 finally realises the ambition my colleagues and I all had all those years ago when we set out to do high quality news television with the most portable and discreet equipment on the market. The first extra piece of kit you have to have is the XLR mic adaptor. There is no way I’d have dumped my Canon C series cameras for this without it. 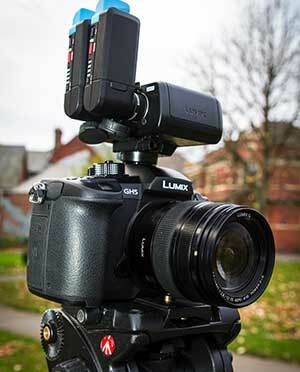 The essential little unit clips neatly onto the hotshoe on top of the camera and puts you immediately on par with the bigger cameras. Use it in conjunction with the Sennheiser AVX system and you’re really singing – literally if you want to be. The tiny adjustable mic receivers plug directly into the XLR audio inputs. They switch on and off automatically with the camera. So it is instantly ready to record when you flick it on and will save battery power when the camera is turned off. It works like a dream and does almost nothing to that all important miniature form factor I so desperately crave. On the battle bus with Tim Farron during the 2017 election I was able to Mic him up before we jumped off on each visit. The discreet lapel mic would track him, while I’d carry a wireless handheld mic in my pocket to vox unsuspecting punters. The set up worked a dream and gave me complete flexibility despite the crowded, rushed and complex visits he was doing. The first snag you should be aware of is that the Panasonic’s XLR Audio unit deactivates the internal mic on the camera. I’d love to have the ability to flick the body mic onto one of the audio channels just because it’s reassuring to have a scratch track, especially when the only other mic you have is a lapel. Obviously you can put a stick mic on the hot shoe that Panasonic have conveniently placed on top of the XLR box but that does start to ruin that all important form factor – I am all about keeping it small! I’ve talked about the audio first because it’s something that rightly concerns DSLR users. Hopefully you’ll be reassured now that you can get quality results without much additional equipment or modification but, what has the actual camera got to offer, you’re probably asking? Well the first thing I’d say here is it’s amazing in-camera stabilization. It has 5-Axis in body stabilisation and if you team it up with a Lumix lens with O.I.S. you have a further level of stabilisation that makes it a dream to use when you can’t take a tripod. And remember, it’s small so you don’t need to be an athlete to carry this smoothly for hours at a time. Sure if you are walking upstairs it’s not going to compete with a Ronin style stabilizer but when I compare it to footage I do with colleagues on shoots where they are using a Canon – even a Canon with IS lenses, the GH5 is by far and away the better camera. When Panasonic first released it there was a weird sideways rock that was introduced by the stabilization but happily that seems to have been eliminated by the September 2017 Software update. If you’re a run and gun shooter it’s just incredibly smooth and a top reason to invest. Even with the fabulous Olympus lenses I use it is a smooth operator thanks to the in body stabilisation. The third reason you must have this camera is the quality of the image - 4k 422/10bit - all internal at 400Mbps! I’ve talked a lot about this camera being a versatile gritty little tool to get into every nook and cranny, but if you want it to play with the big boys on a documentary, studio commercial or music video, this tiny little camera is packing some serious stats. Go the whole hog and buy the Log upgrade and a few of the super fast SD cards and you’re away. Most of the time in news I am not using anything close to what it’s capable of but if I’m doing an interview that I know I’ll want to reframe – it’s all there, 4K at an incredible bitrate. It’s the simplicity of this camera that I love. It uses SD Cards and my MacBook Pro (until I’m forced to upgrade) has a slot for that. The new Mac Pro even has an SD card reader built in from what I can see from the tantalizing screen shots online. It all just fits and works in a seamless, inexpensive and efficient work flow that is accessible to everyone. And finally the price. Camera body, lens and XLR unit plus a couple of fast cards and you’re probably going to get change from £3,000, which is less that the body of a Sony a7R III and this really matters if you’re an independent filmmaker. It gives you the confidence to take your kit to the ends of the earth knowing that if the worst should happen, you haven’t just dropped your livelihood down a gorge. And if you are just starting out in this game, you can buy something that will get you broadcast results without mortgaging your house. Annoying for all those long-in-the-tooth professionals that relied on price to keep the new talent out of the game. There are no in built ND filters, you’ll have to get a variable filter for the front of your lens. The low light is undeniably disappointing – sure, I love everything else this camera has combined with the low light capabilities of the full frame Sony’s or the new Canon C200 but I’ve been in some dingy places and it’s held up. The autofocus was massively derided when it first came out but again the September update greatly improved that. If you keep your eye on it, touching the screen to set the focus points feels so futuristic it’s like you’re on an away team from the Starship Enterprise. Sadly the Face Recognition autofocus for Vloggers is still pretty poor. If you cast your eyes down it loses its way and you run into problems but I find the point recognition works well. All in all there are many reasons I’d like to get a C200 but it wouldn’t be the same. I couldn’t easily sling that in a small bag and get completely immersed in the action I was there to film, travel over the Dolomites on foot for days on end or hang off boats in Lyme Bay with the same ease, confidence and peace of mind. The only thing that stops me recommending you run out and buy the GH5 today is the rumour of the GH5s that is supposedly on its way soon. Watch this space because if this is good just imagine what that will be like!